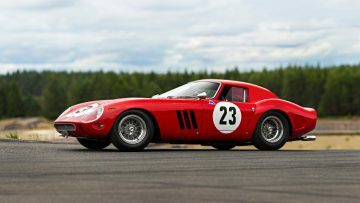 Only 49 cars have ever sold for more than $10 million at public auction with the world record $48 million paid for a 1962 Ferrari 250 GTO. 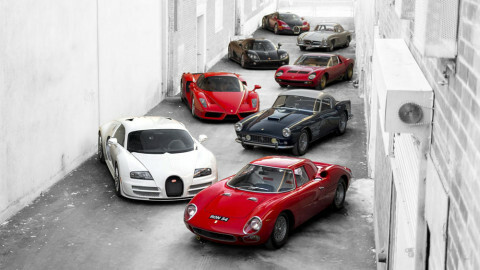 Only 49 cars have ever sold for more than $10 million at public auction. Ferrari is the most-expensive car marque with 250 models especially highly priced. Nearly two-thirds of the cars selling for more than $10 million are Ferraris (29) followed by Aston Martin with four, Alfa Romeo with three while Mercedes Benz, Duesenberg, Jaguar, Porsche, and McLaren each have two cars on the list. The other brands having sold for seven figures plus are Bugatti, Ford and Shelby. In 2008, a 1961 Ferrari 250 GT SWB California Spider was the first car to break the $10 million barrier but most of the $10 million results are more recent: 6 in 2014, 11 in 2015, and 9 in 2016 but only 6 in 2017 and 5 in 2018. 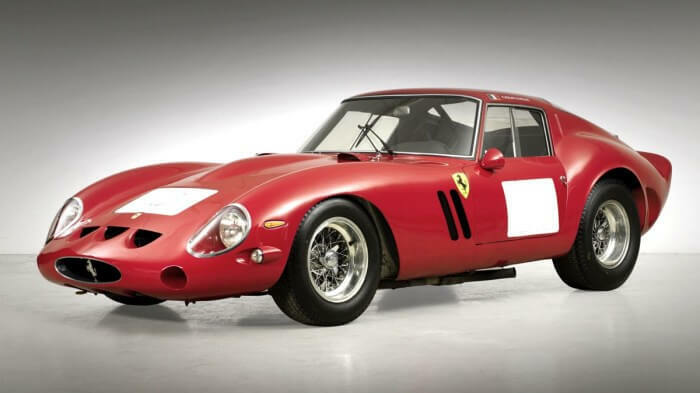 Only twelve cars have ever sold for more than $20 million with the record $48 million for a 1962 Ferrari 250 GTO sold by RM Sotheby’s in 2018. Note: Definitions vary – only results from traditional public auctions are included. No claims for accuracy. Only nominal figures are considered. Wikipedia has a list with adjusted prices. 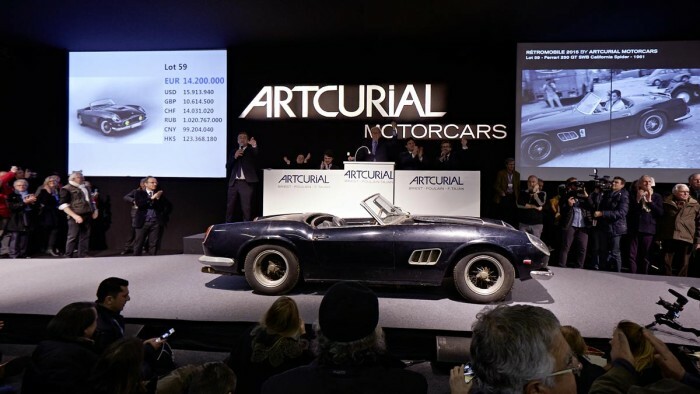 The first car to have sold for more than $10 million at public auction was a 1961 Ferrari 250 GT SWB California Spider sold by RM Auctions in Maranello in 2008 for $10.9 million – a dollar price helped by a relatively strong euro at the time of the sale. This car took the record of most-expensive car in the world away from a 1931 Bugatti Royale Kellner Coupe that Christie’s sold for $9.8 million in 1987. The Bugatti held the record as most-expensive car for more than two decades. 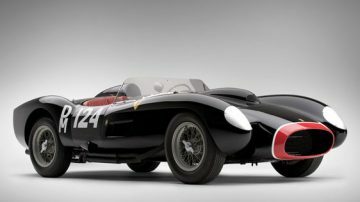 A year later, RM again increased the price-barrier by selling a 1957 Ferrari 250 Testa Rossa for $12.4 million. Only in 2011 was the $10 million limit again broken when Gooding sold a 1931 Duesenberg Model J Roadster for $10.3 million and showed that a works Scuderia Ferrari 1957 Ferrari 250 Testa Rossa is worth more than a privateer car – the new record price was set at $16.4 million. In 2012, three cars sold for more than $10 million – again a Ferrari but also a Ford and Mercedes Benz. In 2013, four cars sold for more than $10 million. 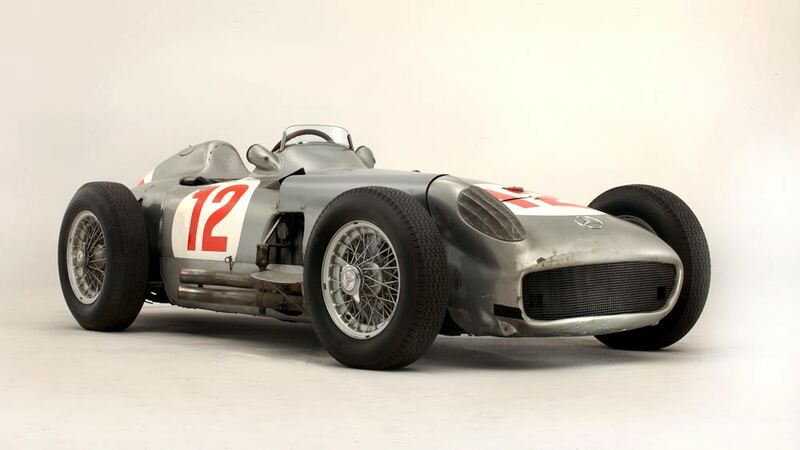 A 1954 Mercedes Benz W196R Formula 1 racing car almost doubled the record price when Bonhams achieved $29,650,095 at the Goodwood Festival of Speed sale in the UK. 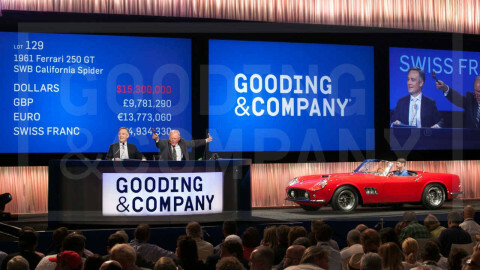 RM Auctions sold a 1967 Ferrari 275 GTB/4*S N.A.R.T. 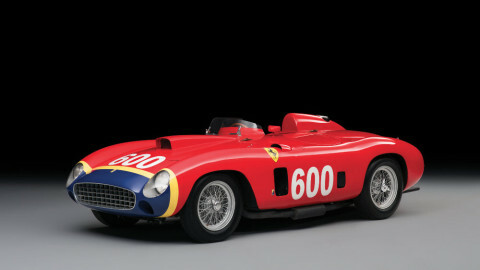 Spider by Scaglietti for $27.5 million at Monterey – still the most-expensive regular road-going car ever. In 2014, six cars sold for more than $10 million. Bonhams again increased the record price when it achieved $38,115,000 for a 1962/3 Ferrari 250 GTO at Quail Lodge – it kept the world record price until 2018. RM Auctions achieved $26.4 million for a 1964 Ferrari 275 GTB/C Speciale by Scaglietti – only the fourth car to sell for more than $20 million. In 2015, eleven cars sold for more than $10 million. 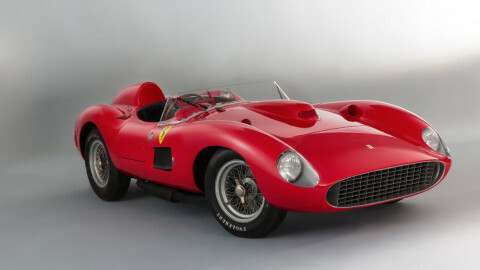 A 1956 Ferrari 290 MM sold for $28 million at the RM Sotheby’s Driven by Disruption sale in New York, as only the fifth car ever to sell for more than $20 million. Aston Martin, Jaguar, McLaren and Porsche joined the list of marques having sold for more than $10 million at public auction. In 2016, a 1957 Ferrari 335 Sport sold for $35,711,359 at the Artcurial Paris Rétromobile auction as only the second car ever to have sold for over $30 million. In euro terms, it was at the time of sale the most expensive car ever – it cost €32 million versus the €28.5 million the GTO cost at the time of sale in 2014. Several new marques and records were added in 2016: Jaguar (most-expensive British car at the time), two Alfa Romeos, a Bugatti, and a Shelby. 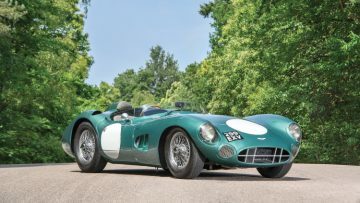 In 2017, only six cars were added to the list – none are from new brands in the $10 million plus group but new marque records where set for Porsche, McLaren and Aston Martin with the 1956 Aston Martin DBR1 setting a new British car record at $22,550,00 at the RM Sotheby’s Monterey sale. A 2017 Ferrari LaFerrari sold as a charity lot in the RM Sotheby’s Maranello Ferrari sale as the most-expensive 21st-century car thus far, and the most-expensive new car sold at public auction. In 2018, five cars sold for over $10 million including four results over $20 million. 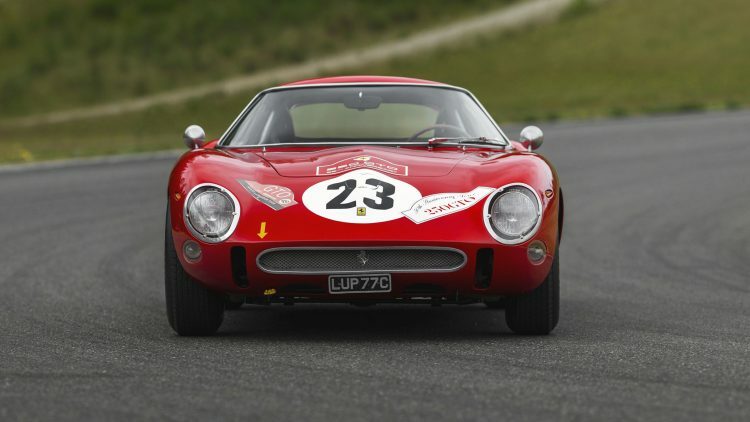 A 1962 Ferrari 250 GTO sold $48,405,000 at the RM Sotheby’s Monterey 2018 sale to increase the highest price ever paid for a car at auction by $10 million. A 1935 Duesenberg SSJ sold for $22 million at Gooding Pebble Beach as the most-expensive American car ever and the most-expensive pre-war car ever. Two Aston Martins joined the list to become the second most common brand after Ferrari on the list of the most-expensive cars in the world. In 2019, a 1939 Alfa Romeo 8C 2900 Touring Berlinetta sold for $19,246,750 as the top result at the Artcurial Paris Rétromobile sale. Ferraris are the most-expensive cars in the world with nearly two-thirds of the cars that have sold for more than $10 million at public auction coming from Maranello. Mercedes Benz, Jaguar, Porsche, McLaren, Aston Martin and Alfa Romeo are the only other brands with more than one car having sold for more than $10 million. 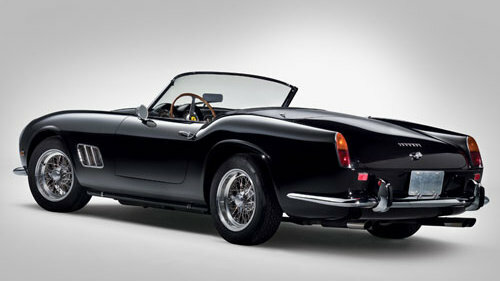 250 is the magic model number – 19 of the most-expensive cars ever were Ferrari 250 models in various model variants. Almost all cars achieving more than $10 million at public auction were built during the 1950s and 1960s. The period 1953 to 1964 is especially highly (ap)praised. Seven $10-million cars date from the pre-War period: a 1935 Duesenberg SSJ, a 1939 Alfa Romeo 8C 2900B Lungo Spider, a 1939 Alfa Romeo 8C 2900 Touring Berlinetta, a 1933 Alfa Romeo 8C 2300 Monza, a 1932 Bugatti Type 55 Roadster, a 1931 Duesenberg Model J Roadster and a 1936 Mercedes Benz 540 K Spezial Roadster – still the most-expensive German passenger car ever. Only five $10-million cars are newer than the 1960s: a Le Mans-winning 1982 Porsche 956, the 1970 Porsche 917K, two McLaren F1 sports cars and the 2017 Ferrari LaFerrari Aperta. No $10 million car is from pre-1930. Most million-dollar cars are sold by RM Sotheby’s, Gooding and Bonhams and these three also dominate the $10-million-plus market. The Monterey classic car week in mid-August in California generally is the best time for high auction prices. Two-thirds of the $10-million-plus results were achieved at these auctions that include Monterey (RM Sotheby’s), Pebble Beach (Gooding) and Quail Lodge (Bonhams). 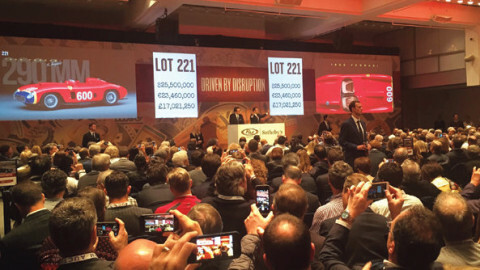 Only a quarter of the $10-million-plus cars were sold at auctions outside the USA. 1931 Bugatti Royale Kellner Coupe that Christie’s sold for $9.8 million in 1987 would be around $20 million in today’s money. If it comes up for auction now, it would probably fetch a lot more than “just” $20 million. 1931 Bugatti Royale Berline de Voyage that Kruse sold for $6.5 million in 1986 would be around $14 million in current money. 1962 Ferrari 330 TRI/LM Spider that RM Auctions sold for $9.3 million in 2007 would be around $10.6 million adjusted. 1937 Mercedes Benz 540K Spezial Roadster that RM Auctions sold for $9.7 million in 2011 would be $10.2 million today. The listing also exclude non-traditional auctions, e.g. a 1965 Ferrari 275 GTB Competizione Clienti sold for a reported $12 million a the Rick Cole online auction during Monterey week 2014.